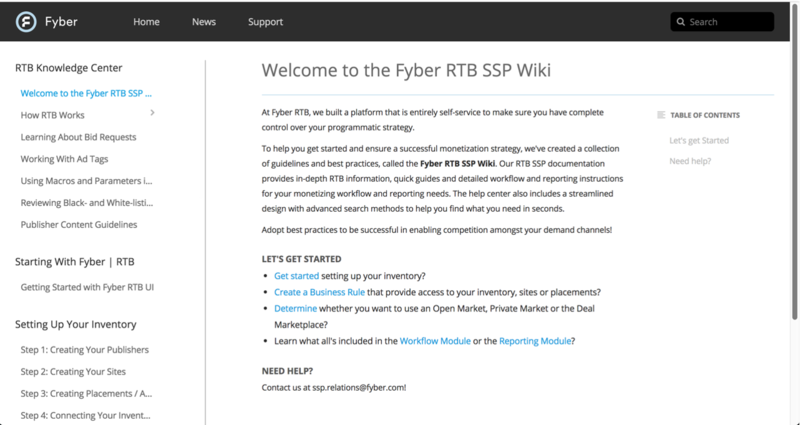 We are happy to announce an all-new Help Center for Fyber RTB SSP and DSP partners. The Help Center will further improve the Fyber RTB experience, as well as make implementation and monetization even easier for you. The Help Center includes a streamlined design with advanced search methods to help you find precisely what you need in seconds. Our completely new RTB documentation provides step-by-step instructions for your monetizing workflow and reporting needs. What does this mean you? No more searching and struggling to find the information you need. It’s there at the click of your mouse. Each sub-menu aspect is explained in detail, along with our best practice recommendations, ensuring you get the most out of the information. The all new Getting Started section explains RTB in detail, going into the nuts and bolts you need in order to understand the RTB world. With new Support and Troubleshooting sections, you can find many answers immediately, saving you valuable time. Easy access to info on set-up steps, making it quicker than ever for you to start monetizing. With the News section (including RSS feed), you’ll never miss another update or piece of valuable RTB information again. You can access the revamped Help Center within your RTB UI at https://ui-rtb.fyber.com/. As always, you can reach out with any questions by emailing us at [email protected] or by contacting your account manager.